Elizabeth I is one of the most colourful characters of British (or indeed, world) history. She's had her share of publicity - just think of all the movies - so she's extremely recognizable even to people who have nothing to do with history. Even if you frown on Hollywood-born fame, you simply have to admit that Her Majesty had her finger in many pies - just try to research history of theatre, or history of piracy (as I did - you can have a look at the results here if you wish). Whichever faintly historical topic you pick, she'll pop up again and again. No wonder then that many books have been written with Elizabeth I as the sole focus. Surprise, surprise, Elizabeth: Apprenticeship is one of them. I have a feeling that the author aimed at something that reads rather like a novel, a thriller perhaps. On the other hand - you can't go on writing thrillers and keep calling yourself a historian. The book ended somewhere in between - too serious to be a gripping novel, too dramatized to be proper scholarship. Ok, I have to say it sooner or later - I didn't like it one bit, for one particular reason that overshadows all other qualities that the book might have. It's the approach "all other historians are wrong, and I am right, because in fact Elizabeth thought this and meant that". And how the hell do you know??? Just as I can't digest literary critics who claim to know exactly what a poet wanted to say in his extremely vague verses, I can't tolerate historians who pretend to know the minds of their subjects as if they had been psychoanalyzing them personally for at least twenty years. I, quite simply, don't trust such authors. 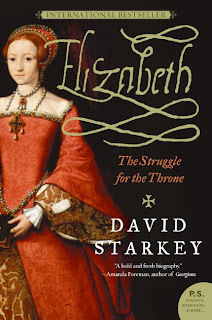 Out of pure contrariness, I start searching for any shortfalls and possible mistakes (which is rather funny, because I'm not a historian, and no matter how much I don't like Starkey's book, he's sure to know his subject far, far better than I). Quite simply, I can't enjoy reading a book if I'm angry with its author - and it makes reviewing the book so much harder, too! I self-consciously admit that it might be my own personal obsession screwing my judgement, but on my personal scale the book gets 3 out of 10. It isn't really THAT bad... But I expected more. You have been warned :).